If you are looking to start up Pickle ball for a group, school or community center, the champion big bundle is the ultimate deal. This bundle includes four of our best-selling paddles (the champion graphite Pickle ball paddle) as well as one dozen Pickle balls of your selection. These graphite paddles are offered in a smaller grip. The paddle's weight range is between 6.9 to 7.5 ounces which is an ideal middleweight for a paddle. These paddles have a large hitting area measuring 8-1/8" wide and 15-3/4" long from top to bottom. The handle measures 5" long. The champion big bundle comes with your choice of balls. The options include all colors and all types of outdoor and indoor balls. If you aren't sure which type of ball you'd like with this bundle, consider the option of a ball sampler pack. 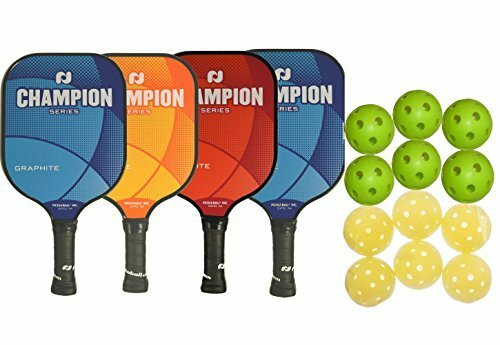 The champion big bundle is the perfect choice for players who want to introduce Pickle ball to a community, or who want to have enough paddles available for a doubles game. If you have any questions about this product by Pickleball, contact us by completing and submitting the form below. If you are looking for a specif part number, please include it with your message.